There are a few alleged places where Christ is said to have been held prisoner. In the north-east side of the Holy Sepulchre there is the "Holy Prison" or "The Prison of Christ", alleged by the Franciscans to be where Jesus was held. The Greek Orthodox allege that the real place that Jesus was held was the similarly named Prison of Christ, within their Monastery of the Praetorium, located near the Church of Ecce Homo, at the first station on the Via Dolorosa. The Armenians regard a recess in the Monastery of the Flagellation, a building near the second station on the Via Dolorosa, as the Prison of Christ. A cistern among the ruins near the Church of St. Peter in Gallicantu is also alleged to have been the Prison of Christ. In the courtyard of the Praetorium the ultimate sentence of Christ was passed by Pilate the Roman governor. According to the Holy Gospels, Christ was transferred here after Anna and Caiaphas to be judged (Matt. 27:1-31; John 18:28-40). Its ruins are now scattered within three different monasteries: 1) In the Franciscan monastery of the whipping of Christ and the convent of the “Sisters of Zion”, which is also called the Praetorium. 2) A small part is saved of the pavement of the “Stone Pavement” of the courtyard of the Roman Praetorium. 3) Also saved is an arch with three gates known as “Ecce Homo”, or “Behold the Man”. It is believed that this arch was part of the Praetorium and at this place Pilate brought Christ to the crowd saying: “Behold the Man”. In the Greek monastery there are ancient caves, one of which is believed to have been used as Christ's temporary prison. 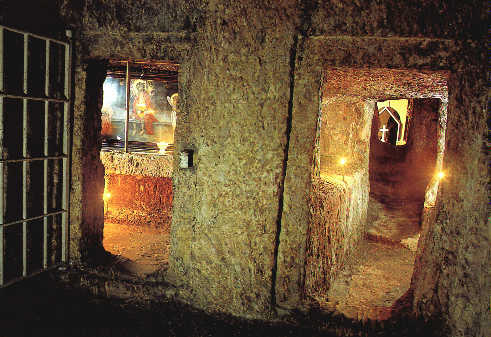 The second one, which is underground, is believed to have been used as prison for Barabbas, the robber. There is also the pool of St. Helen where every Great Friday they have the service of the Great Hours. The present Praetorium was built during the 18th century and belongs to the Greek Orthodox. On the left and behind the chapel of Klapon, there is a small three room flat with a low ceiling, the Prison of Christ. This place owes its name to a tradition according which Christ and the criminals were kept in this prison before they were led to the cross. A second tradition however, mentions that in this place the Theotokos had fainted when she beheld her only Son on the cross. So the prophesy of elder Symeon was fulfilled: "And a sword will pierce through your own soul" (Luke 2: 35).